ruling that allowed filing of I-T returns for AY 2018-19 without linking Aadhaar with PAN. 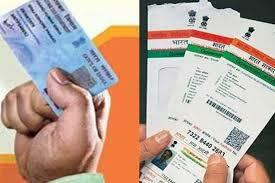 As of now, the government has not announced any official deadline to link PAN with Aadhaar. But, those who have filed I-T returns for FY16-17, without linking PAN with Aadhaar, need to do so latest by March 31, 2019. First off, log on to the online Income Tax filing portal. Next, under the 'Quick Links' section, click on 'Link Aadhaar' option. On the next page, head to 'Click here to view status...' link. Following this, enter your PAN and Aadhaar number in the fields provided. Your PAN-Aadhaar linkage status will flash on the screen. To link your PAN with Aadhaar, firstly, log on to the Income Tax e-portal. Post that, enter details such as Aadhaar number, PAN, Name, and the screen-displayed Captcha code. Submit the details, click on 'Link Aadhaar', and you are done. After successful verification from UIDAI, the linkage will be confirmed.